PhD student in "occupational psychology"
Holder of a DEES in Social psychology from the Faculty of Letters and Human Sciences,Mohammed V University of Rabat, Agdal in 1996. Holder of a DEA (master of advanced studies) in Social psychology from the Faculty of Letters and Human Sciences,Mohammed V University of Rabat, Agdal in 1990. Holder of a Bachelor of Arts in "psychology" from the Faculty of Letters and Human Sciences,Mohammed V University of Rabat, Agdal in 1986. High school diploma in Modern Litterature from Academy of casablanca in 1979. 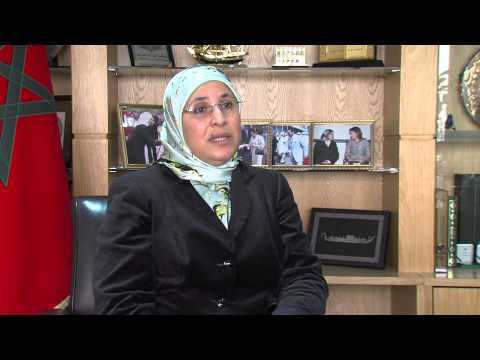 Minister of Solidarity, Women, Family and Social Development ,since January 3, 2012. Secretary of the parliament during the 2009-2010 legislative year. President of the social departments commission in the Chamber of Deputies during the 2006-2007 and 2007-2008 legislative year. Member of Parliament in the course of the 2002-2007 and 2007-2011legislative mandate. Member of the Morocco-EU Joint Parliamentary Committee. Coordinator of the Committee ofSocial Sectors of the Parliamentary Group of the Justice and Development Party (PJD) at the Chamber of Deputies. Local councillor of the district of Anfa in Casablanca since 2009. Member of the Islamic Congress. President of the women's organization of the Party of Justice and Development /PJD since 2011. Member of the PJD General Secretariat since 2009. President of the PJD political forum (2004-2008). President of the Board of Directors of the organization of the renewal women's of consciousness (1999-2004 and 2008-2011). Member of the broad of "Shura" in the unification and reform movement. Women's rights between chari3a and international charters "Islamic center of New Jersey in the USA. 2004. Reform of the Moudawana and reality of Morocco European center of the Mediterranean, Barcelona 2003. Women's emancipation in Islam, al-Azhar University, Cairo 2003. The first Conference on the Arabe Family, UNESCO, Bierut 2003. Modernity and modernization of the Moroccan feminist movement, Human Rights Centre, Rabat, 2002. Women's Rights in the codes of personal status in the Islamic States, Qatar University, Faculty of chari3a, Doha, 2002. Working women: reality and future , documentation center, Rabat 2002. Women and future prospection, International Islamic feminist union Beiruth. 2000. Departmental, and socio-professional issues with regard to the status of women at work "what is the role of women in the strategy of development ." Association of labor inspectors, Rabat.1999. The role of Women in development in Morocco, situation and perspectives Dar al Maghreb, Paris,1998. Woman and Politics in Quoran, International Scientific Council of Muslim Women, Khartoum, 1998. Improvement of women's situation, in deprived neighbourhoods (in French), space dedicated to women. International Book Fair, 1995. Terrorism and differences management association of victims of May 16 , the urban municipality of Sidi Moumen, 2004. Evolution of social thought in Morocco, "seminar on the Moroccan thought, over one hundred years, , Faculty of Letters and Human Sciences, ben Msik, Casablanca, 2000. Methodology of scientific research between subjectivity and objectivity, Faculty of Letters and Human Sciences, ben Msik, Casablanca, 2000. Women's rights between crisis and alternative: a critical study of the project relating to the national plan for the integration of women in development, publication al Forqan series "ikhtarto lakom" Casablanca 2004. The fight against illiteracy, formal and informal education and education on equality, acts of the study day on the project for the integration of women in development, 1999, Rabat. Representations of women in the modernist discourse "rights and responsibilities of women in Islam," the work of the fifth session of the Sahwa al-Islamiyya university, Volume 3, Ministry of Habous and Islamic Affairs, Rabat 1999. The role of civil society in the face of family challenges "the Arab family in the face of contemporary challenges and changes" work of the first conference on family, Ibn Hazm, beiruth 2003. Limit between "plan" and "Family Code":quiet revolution in the Family Code. Charafate series, Azzaman edition, Rabat 2004. Effects, aspects and methodology of the gender approach in Islamic countries (search for participation in the conference of the International Muslim Woman Union in Yemen). Scientific research between what is permitted and what is prohibited (critical study of the book: the woman between what is cultural and what is sacred) zineb Moaadi , research and study circle. Impact of parents begging on child socialization (field study, graduation memory for higher education). Food and mental development of children,: early childhood (memory for the bachelor degree). Mechanism for identity building through cultural references (unpublished research). School underdevelopment and problems of education in Morocco (unpublished research). Program « Kadaya wa arae » , episode,( election 2011 and bills for organic laws). On Alaoula TV Program « massaiyate » (discussion on the finance law in the social sectors). on the national radio. Program « chooun barlamaniya » episode, (the political participation of Moroccan women ) on Alaoula TV. Program « wijhat nadar »,episode (the quota system for women's political participation) on the national radio Episode (the upcoming elections and issues of quota for political participation) on the Tangier's radio. Program « alislam alyawm », episode,( Women in the Islamic discourse) sur on Iqrae TV. Program « Hada balagho nass » episode, (liberation of women, between Islam and international charters) on Dream 2. Program « montada annissae » episode,( Gender, design, outgrowth and futures on almajd TV Program « Wajh li wajh » episode (Plan for women's Integration in Development) on 2M. Program « Alislam lyawm » episode (Women and work) on Iqrae TV. Program « Barlamane almowatinine » episode (Woman and psychological and social effects of work» on Fm casa radio. Program « Fidilal alquoran » episode (almarae wa da3wa ila llah) on Alaoula TV. Program « Barnamaj khass » episode (Establishment of the council of women alimates) on Sudanese TV. Program « li nissae fakat » episode ( Special status beetwen Islamists and secularists) on Aljazeera TV. Program « Ma3a al osra » episode (Reading of the Labour Code) On the Moroccan national radio Program « Kadaya fikriya » episode ( al osra a lmoslima) on Iqraa TV. Program « A3lamoha » episode (Women and contemporary challenges) on ART TV. Program « lobnan wa laalam » » episode (Congress on the rights of the child and nternational plans) on Almanar TV. Program « alhayat holwa » episode (Children and mass media in the Palestinian question) on Iqraa TV. Program « Bissaraha » episode ( attasawol) on 2M. Program "mobachara maakom" episode (sport and national symposium) on 2M. Program "bissaraha" episode (Silate Arrahim) on 2M.